When The Christ Hospital decided to redo two floors of the hospital, they called Building Value to deconstruct the areas slated for renovation. Building Value was able to divert 28,000 pounds of salvaged material from the landfill—the equivalent of two school busses full of debris. The hospital’s director of facilities management was pleased with the work ethic of the Building Value crew and the Easterseals team of individuals with disabilities who helped remove ceiling tiles from the site. “They were all very professional and worked efficiently and effectively,” he said. The Christ Hospital deconstruction represented one of the largest inclusive work environments ever documented locally. 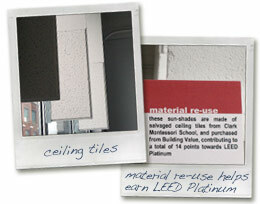 Emersion Design purchased the rescued hospital ceiling tiles from Building Value’s retail outlet, which helped Emersion win a platinum LEED certification from the U.S. Green Building Council (USGBC) for their new office building. Emersion is the first architectural/engineering firm in the country with a platinum office in Ohio. Emersion is already anticipating the day when it calls Building Value for its own deconstruction. “Everything is designed to be taken with us when we graduate from the business center,” says Sean Hesse, an architect with Emersion. “Nothing is glued down or permanently adhered other than a screw or something that can be undone.